We first connected with the team at Victoria Harbour Ferry in the summer of 2016, when they were searching for a way to showcase their new fleet of all-electric boats. The vessels were set to travel up and down the Gorge Waterway, offering tours to visitors and locals from across the region – so it seemed natural to us to create a video that would highlight both the tour and the boats themselves. With no shortage of beautiful summer weather to work with, we shot this piece on back-to-back evenings during that amazing golden hour light. Once on board, we fitted our captain with a lavalier microphone to convey the true experience of being on board a tour. Then our team split up, one with camera operator on board and the other capturing the journey from the shoreline. With a mix of urban working waterways and secluded natural channels, the Gorge is truly a feast for the eyes (and the lens). Once we were satisfied with the key pieces of the shoot, we set up at the turnaround point of the tour (near the Tillicum Narrows) to shoot some drone footage. As always, we were in close communication with the Harbour Control Tower and NavCanada staff to ensure our operation would not interfere with float plane arrivals just a short distance away. Once complete, the video was an intimate perspective of the trip from start to finish, offering an authentic preview of the experience you’ll receive with Victoria Harbour Ferry Gorge Tour – including the oh-so-silent electric motor! It's rare that we have the opportunity to work with Greater Victoria's public school system, but the staff at Parkland Secondary in North Saanich reached out to us to help showcase all the options they offer, including the new International Baccalaureate program, as part of a campaign to boost enrollment. We quickly elected to use students and staff as the voice of the video, describing all of the elements that make Parkland unique. With such a wide variety of activities and clubs to choose from, the challenge was deciding what to include in our two minute window of opportunity. From a dynamic drama program to athletics such as hockey, judo and sailing academies - getting good visual elements was never going to be a problem at Parkland. Over the course of two weeks we made a number of trips to the campus, shooting the bits and pieces that would eventually form the structure of our video. With the help of the NavCanada crew at Victoria Internationl Airport, we were also able to include some stunning drone aerials of the school and nearby Sidney North Saanich Yacht Club. But the final shot of the video was the most challenging of all... at least, mentally. It meant scaling an enormous wooden ladder to rig our camera to the cable raceway above the school's lobby. Once our equipment was secured in place, we set the camera to take a timelapse image every 5 seconds over the course of an hour, capturing students as they filed out of class at the end of the day. With the school logo front and centre for the closing image of the video, our project was complete - an upbeat look at all of the elements that make Parkland one of Victoria's hidden gems. This spring we connected with the team at Wilson's Transportation to begin highlighting their growing list of services to Vancouver Island and British Columbia commuters. One of their latest endeavors is a partnership with BC Ferries to provide daily trips between downtown Vancouver & downtown Victoria. Always looking for a challenge, our team decided that we would try and catch all of the necessary elements for this video (except aerials) in just one day! We met the Wilson's team on the morning sailing to Vancouver and captured the ticket sales agent on board. Then we rolled over to the beautiful Pacific Central Terminal building in the heart of Vancouver to shoot sequences with passengers loading onto the bus, and the Connector rolling back out of town toward the Island. Then the challenge was to beat the bus back to the Tsawwassen terminal for a couple of shots, and then to downtown Victoria to complete the visual journey... it was almost 300km on the odometer by the end of the trip! Later in the week we returned to the Swartz Bay terminal and, in coordination with BC Ferries & NavCanada, shot drone footage of the ferry arriving in North Saanich, completing the trip and all of the elements required for the BC Ferries Connector vignette. It's a fantastic service at an affordable price, and we're sure you'll see one of the Wilson's buses traversing the highway before long! With a new season in full swing, Ocean River Sports asked our team to head back onto the water and capture their newest kayak tour option, an amazing weekend paddle through the Gulf Islands. Our full-day shoot began with a quick 40 minute boat ride from Sidney across to Saturna Island, where members of the Ocean River staff were already on the midst of their pre-season training camp. We pulled into a beautiful sandy beach on an islet near the east side of the Island, and immediately jumped to work shooting the paddlers prepping their kayaks for the first leg of the trip. Once the boats were in the water, we took to the air with our drone to collect some breathtaking images of the group alongside the rugged Saturna coastline. Then we were back in the boat ourselves to get an ocean-level vantage point of these experienced paddlers in their element, traversing tidal rapids and a variety of water conditions throughout the trip. Once pieced together back in editing, we compiled this video to serve as a sales tool on the Ocean River website, while also finding a purpose at trade and tourism shows across North America. With the spring sunshine arriving on the west coast, our friends at Ocean River Sports & Adventures wanted to capture the experience of paddling in Victoria's Inner Harbour and around the Salish Sea. So we set out to collect drone aerials and additional on-the-water footage to compliment some shots from their existing video library, and weave it all together with some insight from the tour guides themselves. As always, the most complicated aspect of our shoots are the aerials using our DJI Inspire 1 drone. With the guidance of both Transport Canada and NavCanada, we were able to identify safe take off and landing locations, along with appropriate windows of time to shoot a group of kayakers padding in both the Selkirk waterway and the Inner Harbour. As a bonus, with the help of Ocean River owner Brian Henry and his boat (the Ocean Rose), we were able to capture beautiful shots alongside the paddlers as they navigated between our two aerial locations. Now we're planning our next project with the Ocean River team - a series of vignettes on their various tours which will begin with a fun day trip to Saturna Island! Stay tuned to our Instagram feed for more behind-the-scenes images! For many years, one of our favourite places to escape into nature on Southern Vancouver Island has been the Swan Lake Christmas Hill Nature Sanctuary. It's a beautiful little oasis not far from downtown that features a fantastic nature house, and all the bird watching you could ever want. That's why we were thrilled to jump on board and help them create a video to showcase 40 years in the community. Over the course of two weeks, Executive Producer Mike Walker spent a handful of early mornings and late evenings at the lake, capturing the wildlife images for the video. We then teamed up with Swan Lake's Executive Director Kathleen Burton and a team of volunteer actors to showcase the other elements of the sanctuary - including a trip to the top of Christmas Hill, some fun in the nature house and of course a stroll along the floating boardwalk. There are a long list of reasons why you should spend a few hours at Swan Lake - but not the least of which is an opportunity to support a great organization that promotes nature and outdoor adventure in Victoria! 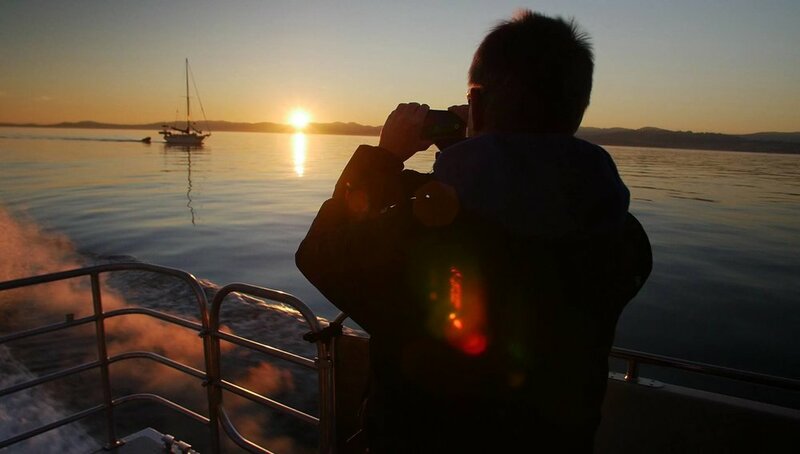 Heading into the summer, it was time to make the most of another whale watching season and update one of our most popular videos - the experience feature for Eagle Wing Tours. With ever-expanding camera technology at our fingertips, the plan called for shooting this entire project in sterling 4K resolution, to give the view a more detailed look at life on the Salish Sea. So our team settled in for many hours on the water with the Eagle Wing crew, covering nearly every nook and cranny of the Victoria coastline to capture orcas, humpbacks, seals and sea lions from the perspective of a wildlife tour with one of the country's most respected brands. Shooting smooth footage on the open water will forever be a challenge, but every once and a while you get the perfect combination of calm seas, amazing light and whales in the right spot - that's when the magic happens. But more often than not, we come back from a four hour trip with no more than 30 seconds of usable footage! The mandate this year was to create a more guest-focused video, giving potential customers an idea of the Eagle Wing experience from start to finish. With that in mind, we also spent some time at Fisherman's Wharf, collecting those early morning images that set the tone for the entire video. Capping the project off with some authentic sounds captured while out on tour (whales breathing, orcas vocalizing, and more) and a newly animated Eagle Wing logo, another summer of hard work in the most beautiful environment on earth is in the books! One of the elements that sets Eagle Wing Tours apart from the pack is their wide range of options to get you out on the Salish Sea. Our latest project was the task of showcasing the fleet in a quick, high energy clip that could live on the company website. With the help of our DJI Inspire 1 drone, we first captured some dramatic aerial footage (thanks to some talented piloting by the Eagle Wing captains). Then we began digging through several years of archival footage to pull out the scenes that featured the vessels, like the catamaran 4EverWild and open boat thrillride that is Goldwing. Each boat offers a different experience for the guests, but regardless of which open you choose the Eagle Wing staff will get you into the action for an incredible up-close look at the wildlife on Vancouver Island's coast. As part of their on-going efforts to run a sustainable business, the team at Eagle Wing works with the Greater Victoria Harbour Authority and other Fisherman's Wharf businesses to host a World Ocean's Day event every spring. We produced this little clip to help promote the event across all social media platforms, giving families a sneak peek at some of the amazing programs hosted down at the dock. With a mix of fresh footage from last year's event, and some from our time on the water with the Eagle Wing crew, we had all of the necessary pieces to build a 30-second spot. Adding a little magic of Adobe After Effects puppet tool animation to bring the octopus logo to life, we finished off a clip that has racked up thousands of views online in support of a great community event! Eagle Wing Tours, located at Fisherman’s Wharf in Victoria, was one of our first clients at Roll.Focus. We have produced videos for this fantastic company ranging from experiencing their tours, to their lauded conservation and sustainability efforts, to their fleet of tour boats. Our first promotional video was created two years ago, so with their new website under development it was time for a fresh feature. We have gone out onto the water with them for the last two summers and have seen a variety of wildlife including orcas, humpback whales, Dall’s porpoises, harbour seals, stellar sea lions, sea otters, seagulls, bald eagles, and more – all featured within this new video. It’s taken time and practice to get great shots on the ever bobbing boats with our Panasonic GH4s. However, having our Inspire DJI Inspire 1 on board for all the stunning visuals, as approved by Transport Canada and Department of Fisheries & Oceans, has only improved the quality of our production package. You can see another video of our take offs and landing in this fun feature below – Mission Impossible style! Over the past two decades, Eagle Wing Tours has built a reputation for being one of the most environmentally conscious businesses in Canada - and one of our first projects with the team at Fisherman's Wharf set out to highlight some of the ways Eagle Wing is caring for the Salish Sea. With the help of orca expert Ken Balcomb (from the world-renowned Center for Whale Research), this video breaks down several of the programs featured in Eagle Wing's sustainability mandate. They are Canada’s first 100% carbon neutral whale-watching company and members of 1% for the Planet, and also serve as founding members of the Victoria Sustainable Tourism Alliance (ViSTA) - partnering with environmentally responsible businesses committed to developing and promoting eco-tourism. There's no doubt that our partnership with Eagle Wing Tours has help set the standard for giving back in our own business, and our team constantly strives to continue their example of fostering the next generation of environmental stewards! We’re often out on the water with our client, Eagle Wing Tours, capturing a variety of video that features the experience, Eagle Wing’s boats, their conservation efforts and the wildlife. In October, we were out capturing drone footage of four transient orcas (the family T69s) when they led us to an enormous flock of seagulls, indicating a school of herring or krill were nearby. Unfortunately, these birds are also not fans of our drone and, seeing it as a threat, love to chase it. Forced to land the drone, Executive Producer Mike Walker pulled out our GH4 to continue capturing any ensuing action and would not be disappointed. That’s when he saw the large male in the family, T69C, try to flip the seal twice, allowing for Mike to set up the shot for the next attempt, and that’s exactly what happened. Mike’s ensuing “Yes, yes, yes, yes!” (despite what some YouTube commenters believe) was out of sheer excitement for capturing this moment on film and not due to the poor seal’s fate. We decided to cut the resulting footage into a small montage of the tour’s events, send it off to Global BC, gathering nearly 1 million views, and once we posted it to YouTube, it’s reached over 2 million views. There have also over 50 fantastic outlets sharing it as a result, most notably Time Magazine, Washington Post, IFL Science, National Post, Chicago Tribune, LAD Bible, etc. It’s been a learning experience of navigating such a large reaction, but we’re thrilled to have received such exposure for our first client and for Victoria as a whale watching destination. One of our favourite things to do in Greater Victoria is going for hikes on nearby trails (year round!). It was a no brainer, then, when local conservation group Nature Trails Society contacted us about creating a video to feature their quest for new hiking, cycling and equestrian trails – we were happy to help. Victoria has an abundance of natural surface trails; however, these trails are currently not coordinated or even connected to each other, thereby missing out on the huge opportunity to create a comprehensive world class network of trails that could ultimately become as famous as the West Coast Trail or the Grouse Grind. This video is a call to action for those who wish to help in assisting with the construction and coordination of new trails, while also being used as tool of awareness for the Nature Trails Society. Additionally, we're always getting a workout on these shoots from lugging all our gear along with us into the forest! There’s a new conductor in town: Maestro Christian Kluxen has been appointed as the new Music Director of the Victoria Symphony, starting in their 2017/2018 season. Christian, of Copenhagen, Denmark, was in town for the announcement and our team was brought in to create a series of video vignettes to help Victoria get to know him better. A handful of locations around town were chosen to both photograph and capture footage of Christian, including Ross Bay, Ogden Point, the BC Parliament Buildings, and Union Pacific Coffee. And though the weather was drizzly and gray, he couldn’t have been a better sport about the entire afternoon. Whether jumping on the breakwater, laying in seaweed, or wading barefoot into the icy Pacific, Christian kept a smile on his face the entire time. While the rainy weather was a challenge at times that afternoon, it became so much easier with teamwork. Special shout-outs to the Victoria Symphony team, Jill and Molly, for not only have plastic bags on hand to protect our gear, but for the little details like brand new, dry socks for Christian when we had soaked them. And we couldn’t have done it without our intern, Joe Webster, who was absolutely indispensable helping out that day as we moved from location to location under a tight time frame with a lot of gear to manage. It was also a pleasure to team up with Kevin Light of Kevin Light Photography and Lara Minja of Lime Design and see them bring their creative vision to life. We were especially left in awe seeing Kevin go that extra mile to get the best vantage point for his shot – namely, in a dry suit, floating in Ross Bay with his camera tucked securely in waterproof housing while he captured unique imagery. Congratulations to Christian, who we look forward to working with on more projects to come! As part of their platinum anniversary, the Victoria Symphony wanted to create a series of videos to promote their brand both here on Vancouver Island and across the country. We set out to create one video that sums up the orchestral experience, and the various venues they have occupied over the years. Our opening shot is thanks to the beautiful pipe organ balcony at Christ Church Cathedral, while we also used elements from concerts at Butchart Gardens, UVIC's Farquhar Auditorium (thanks to Daniel Pender for his excellent shots) and of course, the Symphony's home, the Royal Theatre. But when it came to the grande finale, we knew we had to leverage the spectacular scenery of Symphony Splash - the annual concert in Victoria's Inner Harbour. So, under the guidance of Transport Canada and NavCanada, we pulled off the most challenging drone flight yet - navigating heavy boat and foot traffic (and the occasional curious seagull) to capture the stage and the crowd from a never-before-seen vantage point. All in all, it made for the perfect last impression for the promo spot. The other element of this project included a series of point-of-view vignettes that could be used as teaser videos for upcoming shows and events. We enlisted the help of Symphony conductor Tania Miller, along with timpanist Bill Linwood, to show a behind the scenes look at the moments leading up to the show. Using our AllSteady Pro 6 gimbal, we followed each of our volunteers through their routine from backstage and into the spotlight, and also included a scene from the eyes of an audience member at the Royal Theatre. There remains one more video in our series with the Symphony, exploring 75 years of history in the Capital Region. Watch for that clip in Spring 2016!